Spacesaver Knows that a Military Base is like a Small City. People live, eat, study, exercise, perform, and sometimes even seek medical attention within the confines of the base. Unique and thoughtful storage solutions can assist in the creation of highly functional spaces within the military base environment. The mission of aircrew flight equipment teams is clear: to make certain aircrew and passenger life support equipment is in peak operating condition at all times. When there’s no room for error, look to Spacesaver’s aircrew flight support storage solutions. From survival kits to inflatable lifeboats and more, our wide range of industrial storage and small parts storage solutions help ensure life-support equipment and supplies are always ready and secure. 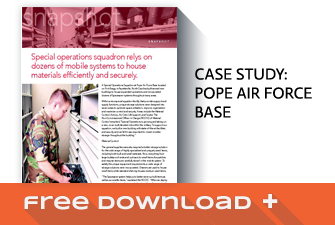 Download: Learn how Pope Air Force Base solved their aircrew flight storage challenges. Like any office, military command operations rely on the well-organized storage of information to ensure peak efficiencies. But it’s no simple task given the military’s ongoing transformation, frequent deployments and resets – all of which are made more complex by BRAC. If better information management is the mission, successfully accomplish it with Spacesaver. The storage needs of the U.S. Armed Forces rival those of a city in their volume and variety. And it’s often up to the Civil Engineering Squadrons and Public Works directorates to determine the best use of space for units on base that are changing and have a vast array of storage needs. Spacesaver’s goal is to partner with you in the design process – and add value by virtue of our extensive military experience and unequaled storage expertise. 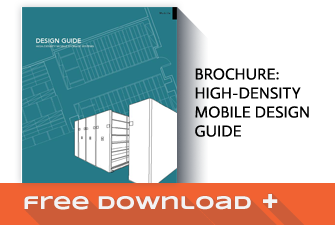 You can plan and design your facilities with confidence, knowing that critical storage issues are addressed and that facility space is optimized. Our strong handle on government contracting also simplifies the procurement process. When it comes to paperwork, it’s hard to beat the Judge Advocate General’s Corps. Yet many JAG offices are tasked with the need to store seemingly unlimited volumes of material. And the files keep coming. The challenge is compounded by the need to maintain credibility and tight security. Ensuring reliable transportation is mission critical and is made increasingly challenging as new technologies are incorporated into both vehicles and aircraft. Parts and supplies must be on hand so vehicles and aircraft, both new and old, are always mission-ready. Maintenance units must also continue to rely on an increasing number of manuals and service bulletins for each vehicle and aircraft. Organization and inventory of parts, supplies and tools – and the capacity to store it all – can be expertly and readily managed Spacesaver storage solutions. U.S. military and VA hospitals across the globe are pressed for time and space as they strive to provide the best possible healthcare for our deserving servicemen and veterans. Rapid deployment of military personnel also creates a host of security and medical records management challenges. Spacesaver’s mission is to support military healthcare practitioners. Our healthcare storage solutions are specifically designed to help medical professionals do want they want to do most: spend more quality time with patients. Providing top-notch security at all times is the charge for military police and security forces. And the job doesn’t end there since the critical nature of evidence management and secure evidence storage also falls on the shoulders of any security unit. It’s a two-fold challenge that calls for immediate access to weapons storage and gear storage, combined with the need to safeguard confiscated evidence until the case makes its way through the justice system. With Spacesaver, you’re covered on both ends. No other company can offer the same level of knowledge and industry expertise, along with the industries most complete and innovative line of storage solutions.